While looking for a birthday gift for my wife, I came across Kaboodle.com, a social shopping site that lets you shop with your friends online. Cool idea. There’s a section on their homepage titled Popular Stores that lists Etsy as its first item. I recognized Etsy, so I clicked through to see what Kaboodle has to say about them. A fair chunk of my screen is used by ads and for their nontechnical, small-monitor-owning target audience, it would make up even more. There’s a tricky balance between making the content easy to find and placing ads in prominent positions to increase clickthrough rates and profits. You want ads but you don’t want so many that people have no reason to come to your site or can’t find the information once they’re there. If you cover you three quarters of your site with ads, you’d likely lose a significant portion of the new visitors who can’t quickly find what they’re looking for. And just because you can place more ads doesn’t necessarily mean you should. 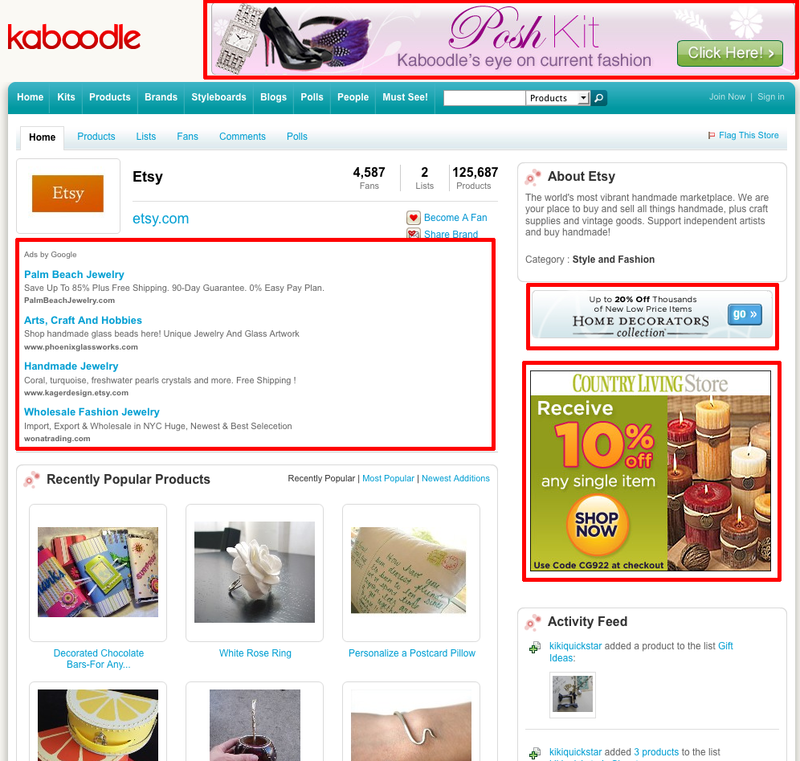 Its possible that a few well placed ads on Kaboodle would result in more people sharing the site, which would lead to more visitors to the site in the long run and higher profits. But who knows. Maybe the majority of their nontechnical target audience thinks the ads are the content. Or maybe they know they’re ads, but don’t care because hey, it’s an online shopping site. Maybe Kaboodle has A/B tested their pages dozens of times and have determined that this is the optimal ad to content ratio. Maybe they don’t care about the people who care about ad placement because those people, like me, never click the ads (that’s probably true). And maybe the people that can’t find the content because they can’t scroll past the ads are also the people who believe their identity will be stolen if they use their credit card online, so won’t buy anything anyway. There’s an important lesson here for picky web developers like me: most people are not picky web developers. Posted on July 29, 2009 by Mazur. This entry was posted in Uncategorized. Bookmark the permalink. I use Adblock Plus and the Safari Adblock extension. No ads, no problems. Thanks for the pointer, I’ll check it out.